Sun cream: This is a pretty big deal. If the sun is shining from April onwards, for fear of owning pink children, you must not leave the house without the obligatory sun cream ritual. This is messy. We use some crazy high factor somewhere up in the 50’s. It’s water proof, it stays on all day and it costs a fortune. Actually getting it on your Redbull sponsored toddler should be an Olympic sport. Trying to get it on your Redbull sponsored toddler and NOT on yourself is impossible: they always want a reassuring hug once the deed has been done. It must be the stress of being waited on. Cue interesting patterns of white splodges on your body by the end of the day. A whole new meaning to checking out your white bits. Ice Cream: I have been known to tell my eldest that the merry little ice cream van tune means that they have run out. But my conscious is beginning to catch up with me on that one so this summer we are embracing Ice Cream In Public. I now have a strategy with my toddler, and I’m happy to share: strip her down to her nappy. Ice cream comes off of skin much easier than clothes. I probably do look slightly alarming as I begin to strip her down on our approach to the ice cream stand, but I’ll be thankful for this later. Ice cream before kids meant you actually got to eat one! You need both hands free when ‘enjoying’ an ice cream moment with your children, so Ice cream is now supermarket bought and devoured after bedtimes these days. What to wear: This point applies to us Mumas. I have a little check list that hot weather clothing have to pass prior to purchase nowadays (I cannot begin to explain the sadness this brings me as a girl who used to have her skirts mistaken for belts!) The length has to pass the ‘can I lean in to the car to strap the girls into their seats without flashing? This is actually not just a length issue but the flimsiness of the fabric: Big factor! Yes, speaking from bitter experience: Apologies fellow Lidl shoppers. Sand: I just hate it. I mean I used to love it when it was safely on a foreign shore, beautifully white- slightly burning my bare feet as I strolled along to order another cocktail… ah bliss. Sorry, where was I. Sand now keeps on popping up everywhere, it seems to have been added to all of the local parks where we live. Sadly cats also like this new council initiative. I know this as my children like to dig for buried treasure in these sand pits. Say no more. 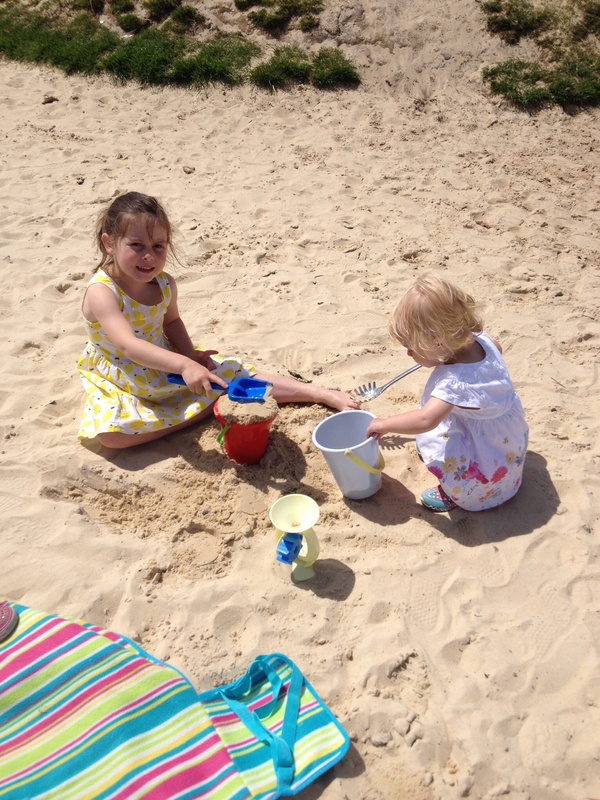 Once you have had the hot weather fun at the park with your bucket and spade (or cooking utensils as my children use!) you can carry on enjoying it for the next few days too. It has a habit of sticking to clothes, shoes, bags, leaving little pools of it in the kids car seats and buggy for them to chuck around at a later time of their choosing. Super. Long summer nights: The days are getting longer, I remember skipping out of work in daylight at 7pm pre-children. Maybe stopping off for an alfresco vino. How civilised. However, now the long summer nights seem to be the bane of my life. Not only have I had to brush up on my science to try and answer the cries of “If the sun hasn’t gone to bed then I’m not going to bed!” to a very irritated and confused 4 year old, we have had to install the darkest most blackout of black out blinds with thick curtains in ToddlerMonsters room. It’s like walking into hibernation in there come 7pm in my desperate attempts to hide those pesky rays. I do silently fantasise over a huge black out cloth being thrown over our entire house on occasion. How sad is that. Lastly, we are going on a holiday this summer, with the ToddlerMonster, on a plane. I’m happy to do a public service and publicise the flight details so that you can all avoid my wilful youngest. Didn’t I see something about easy jet changing their rules so you will have to pay to sit with your children… They have sooooo got that round the wrong way. I’m appealing to fellow Mumas out there- are you just as on the edge as I am when it comes to the summer? Let me know..